“ From my personal experience, this is the perfect accompaniment for any ballet class. Christmas Modern Melodies is guaranteed to get you and your students into the festive spirit! This 35 track CD features a mix of traditional Christmas carols such as The First Noel and Bethlehem plus Christmas pop classics including Last Christmas, Fairytale of New York & Jingle Bells. David is a regular class and examination accompanist for the Royal Academy of Dance, Imperial Society and the British Ballet Organisation and has played for regional and national courses for these respected bodies. David Plumpton has regularly accompanied Professional Dance Experience’s Director, Michael Berkin and has also worked with such international artists as Darcey Bussell CBE, Jonathan Cope, Dame Beryl Grey, Gillian Lynne CBE, David Bintley CBE, Sir Anthony Dowell CBE, Wayne Eagling, Christopher Gable CBE, David Nixon OBE and Wayne Sleep OBE. David has accompanied the Royal Ballet, Birmingham Royal Ballet, Scottish Ballet, New Adventures, Rambert Dance Company, Pheonix Dance Theatre, New English Contemporary Ballet and the Mark Morris Dance Group; additionally he has collaborated on education projects with Birmingham Royal Ballet and Northern Ballet and has played for the Royal Ballet School’s Associates programme. David Plumpton is passionate in his interest for dance, for working with teachers, professional performers and aspiring students. 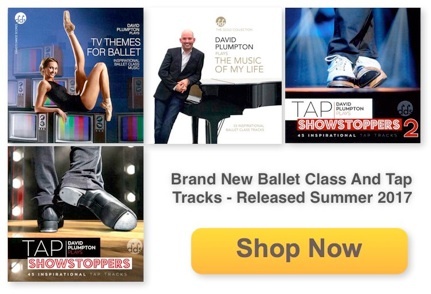 He is delighted to have released a series of ballet class CDs which capture and embelish his belief that that ballet can be fun, exciting and above all else artistically emotive. Modern Melodies contains 43 tracks ranging from movie blockbusters including Harry Potter, Pirates of the Caribbean, The Flinstones, to TV favourites such as Strictly Come Dancing, Cheers and Happy Days. Guaranteed to fill your ballet classes with energy and excitement! West End To Broadway is packed with 39 tracks from the West End. Featuring music from some of the greatest musicals ever including Wicked, Mamma Mia, Cats, Hairspray, Miss Saigon, Starlight Express and Grease, this CD is sure to be a hit with your students. Divas is a 32 track CD packed full of powerful modern classics from the pop world. With melodies from artists such as Whitney Houston, Madonna, Maria Carey and Celine Dion, this CD is sure to bring inspiration and energy to your ballet classes. New Classics features 34 tracks from some of the most famous classical ballets and operas including Carmen, Turandot, Romeo and Juliet, Spartacus, La Bayadere and La Sylphide amongst others. Perfect to fill your ballet classes with beautifully played and emotive classical music. to be popular with your ballet students. West End to Broadway 2 was recorded by popular demand as a follow up to fantastic West End to Broadway CD. Featuring 37 tracks from some of the world’s most popular musicals including Les Miserables, Chicago, High School Musical, Mamma Mia, Oliver and Avenue Q, this CD will inspire your ballet students, filling your classes with energy and enthusiasm. West End to Broadway 3 follows on from the stunning success of David Plumpton’s earlier collection of show stopping tunes from the world’s favourite musicals. Featuring 36 popular tunes from classics such as Annie, Billy Elliot, Les Miserables and Wicked to name but a few... guaranteed to fill your ballet classes with energy and excitement! The Music of Andrew Lloyd Webber is the first CD in David’s new ‘Gold Collection’. Lloyd Webber’s soaringly beautiful melodies are an ideal accompaniment for any ballet class. Packed full of melodies from classics such as Phantom Of The Opera, Cats, Jesus Christ Superstar and Evita this 36 track CD is sure to inspire your ballet students! Divas for Ballet 2 features 35 hit tunes from some of the world’s most popular pop divas! From classic tunes by the greats such as Whitney Houston, Shirley Bassey, Celine Dion, Kylie Minogue, Cher and Madonna to modern hits by Lady Gaga, Lilly Allen and Adele, this CD of high energy hits is a must for every ballet teacher! Modern Melodies 3 is the follow up to the super popular Modern Melodies 1 and 2. With 35 tracks of high energy music, never before recorded by David Plumpton this CD is guaranteed to fill your ballet classes with excitement and enthusiasm. Rock and Pop For Ballet is packed full of classic tunes from the world of Pop and Rock. With melodies by artists such as The Beatles, Take That, Elton John, Rhianna and Queen, this CD will fill your classes with energy and have your students humming along too! New Classics 2 features beautiful classical melodies from a selection of famous ballets as well as original compositions by David Plumpton himself. Each track is played in David's instantly recognisable, emotive style. This CD is certain to become a favourite for you and your students. Christmas Modern Melodies 2 New for Christmas 2015: David Plumpton Plays Christmas Modern Melodies 2!